Walking The Dog - American roots-n-blues music played on tubas, washboards, upright bass, harps, national guitars, ukuleles, banjos, mandolins, trombones, saws.you know, ACOUSTIC STUFF. AMERICAN ROOTS ‘N BLUES music, according to most scholars, is a blend of Euro-ethnic songs passed down from generation to generation and mixed with African rhythms. Many tunes were composed for fiddles and were played and passed along as two step dance pieces and reels. Some tunes, with lyrics were printed with shape notes on broadside sheets, big newspaper size pages, and sold by traveling salesmen. Others tunes were local ditties sung and played in saloons, or spiritual songs sung in Church. While other tunes were “made-up” and sung as field hollers or work songs. Wagon Trains, River Boats and the Rail Roads moved the music across the land with the people. It was uniquely American music created through the mixing and melting of the cultures of the various peoples who emigrated and settled around the United States. Just like local food, the music also took on a local “flavor”. When interviewed by early music researchers about the origins of local tunes many of the old timers from all over said that they believed that music comes from listening to natural, everyday sounds. They believed that after a song has been chanted in the hot fields or stomped out on the front porches and at fish-frys for a long enough time, it gets “stuck in your ears”. Some songs come from the wishful tunes hummed low by gamblers shooting dice in back rooms; or the songs of praise shouted out by the faithful who have Jesus on the main line and the Devil knocking at the back door. Good songs tell a story that usually starts somewhere in the middle and has no end. Then everyone who follows along later and sings that song adds a little something to it. They add their words and experiences. These players put “life” into the music that they play as they pass it along at the same time. We as musicians who have grown up in the South and even those who have not, have the greatest respect for those that have played this music before us. We too are story tellers and hope that someday we too might pass the light and the music on to others who will come along to play after us. It was in this creative spirit that we assembled down in New Orleans, LA. in August 2008 to record this CD, WALKIN’ THE DOG. It was an international gathering of Southern Americans, British and Japanese. But music is its own nationality with its own language. 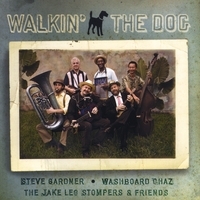 Walking the Dog is a collaborative musical project that began with Steve Gardner, from Mississippi, now based in Tokyo and Washboard Chaz Leary, of New Orleans. The two put a plan for a recording into the works after a series of successful Tokyo performances, that centered around the annual Tokyo Bourbon Street Mardi-Gras Festival, which was Washboard Chaz’s introduction to Japan. Walking The Dog is a combination of original tunes; New Orleans, Mississippi and Memphis string band and jug band standards, a few obscure tunes from the turn of the century and a spiritual thrown in for good measure. The vocal work is shared between Steve Gardner, Washboard Chaz Leary and Bill Steber with everyone else in the house, including recording engineer Nick Vitter, singing back-up, clapping hands or barking like a dog! Brandon Armstrong handled the tuba, trombone, bass, banjo, guitar and backing vocals while Hisa Nakase played bass and rhythm guitar and sang back up. Bill Benfield played mandolin, lead guitar and slide guitar. This CD, “Walkin’ The Dog”, is like a journey down the Mississippi River, which runs brown like whiskey through the Mississippi Delta, all the way to New Orleans. The tunes float along lazily and crazily just like that mighty river. DIGGIN’ MY POTATOES is a Peidmont (North, South Carolina, Georgia) favorite and one of ours too. It is the story of a fellow who has found someone trying to steal his woman and he is doing his best to catch him at it. FREIGHT TRAIN is a traditional tune put together by the left handed guitarist from the Carolinas, Elizabeth Cotton. She and this tune gained a new popularity in the early folk blues revival of the 1960’s. MIDNIGHT SPECIAL according to legend is the night train which ran out of Houston, TX. It is said that its light would shine into the Sugar Land Prison as it headed down to San Antonio. As the legend goes, a prisoner would be set free when the light from the Midnight Special shone into his cell. The song is quite old and originates in song legends passed down from the late 1800’s and may have had its origins in North Carolina; but we based our version on the 1934 Huddie William “Lead Belly” Ledbetter version recorded by John and Alan Lomax for the Library of Congress. JESUS ON THE MAINLINE is a traditional gospel tune that adds a very modern twist for the time- that prayer is just like talking to Jesus on the telephone. In the days before private phone lines, all calls were put through a switch board and handled by an operator who connected everyone to the “mainline”. SITTING ON TOP OF THE WORLD, by the Mississippi Sheiks, is one of the early “standards” that set a pattern for other great classics like “You Got To Move” and “Come On In My Kitchen”. I spent many memorable afternoons, playing blues sitting in the Hollandale, Mississippi home of Sam Chatmon, the last member of the Mississippi Sheiks. Mr. Sam left me two great pieces of advice-(1) Everyone needs a chance to be told to sit down. Which he often did. (2) Play your own music as yourself, not trying to be someone else. Which I try to do every day. DARK TOWN STRUTTER’S BALL the 1917 Shelton Brooks tune is one of the earliest traditional jazz songs to become a jazz standard. It was inspired by the 1915 Pacific-Panama Exposition in San Francisco. It is still up-to-date and fun today after nearly 100 years! BAD LUCK BLUES is Blind Lemon Jefferson’s 1926 gambler’s lament, win or loose we all want to go back home. MEAN OLD FRISCO is a traditional tune that blues legend Jessie Mae Hemphill used to play for me when we would be jamming together in her mobile home up in Como, Mississippi. HIGH STEPPIN’ TO NEW ORLEANS was composed as a group effort among the whole band and headed up by Bill Steber. During his crayfish omelette breakfast Bill hummed and wrote the lyrics down on napkins for a couple of mornings before we all headed into the studio for another day of recording. HELP ME is one of the many Sonny Boy ll classics that have inspired generations of musicians, just like us. As a matter of fact it was the inspiration for the Memphis classic, “Green Onions”. GLORY, GLORY HALLELUJAH is a spiritual which has been passed down since the American Civil War. As children we heard it and sang it. One of our favorite recorded versions of this tune is by the great North Mississippi Fife player, Mr. Otha Turner, who always played it at his picnics and live shows and who has gone before us to “lay his burden down”. We hope that you enjoy this CD and the music that is on it. Thanks for your support. So, stand tall, drink your whiskey straight, play your music loud and walk your dog every chance that you get! This is an earlier CD by the group. For a later CD see "Wooly Bully Express" by the Jericho Road Show. The music includes guitar, banjo, harmonica, washboard, upright bass, tuba, trombone, ukulele, mandolin, percussion and vocals. Highly recommended if you like this type music. You can sometimes catch them on tour. Live performances are all unique and include a little audience participation (plus they will autograph the CDs).